As I read through the reverse-chronology of Whitewalling, I couldn’t help but get the sense of history repeating itself, it made me think of the Santayana aphorism, “Those who cannot remember the past are condemned to repeat it.” Can you to speak to the role of history—and perhaps revisionist/negationist history—in the ideology of white supremacy specifically in relation to the art world? One thing I argue for in the book is that these histories are not simply repetitive but recursive—in other words, their repetition is inevitable, baked into the systems in which they occur. Art institutions will continue to protect whiteness because they are designed to protect whiteness. It seemed to me to be interesting to frame the conversation about the Dana Schutz controversy at the 2017 Whitney Biennial with these other, past examples so that, first, we wouldn’t get lost in a sort of “presentist” way of thinking—the idea that we are the first to pay attention to such issues—and, second, that we’d be able to see how the institutional conditions that led to the protests against Schutz’s painting were already percolating back in the 1960s. That’s precisely why focusing on institutional or structural racism is so important—because it shows how, no matter how well-intentioned or evolved individual actors are around issues of race, unless institutions are completely remade, no real change will happen. At the launch of Whitewalling at the Brooklyn Museum on May 2, Lorraine O’Grady said something so perceptive and terrifying it bears repeating: she noted that we are dangerously close to a point where white supremacy will no longer need white people in order to reproduce itself. In other words, the structures and institutions we have in place to allow it to exist in perpetuity are sufficient to ensure we’ll be living in a white supremacist future, unless we completely revolutionize them. This idea of the intertwining of institutional structures and history I think relates to the archive, which is so important to artist practices and activist legacies alike. What was your process of archival research for your book like (both in physical archives and on social media)? I am trained as an art historian, so the archive has always played a big role in my thinking—both in terms of what gets saved, recorded, and remembered and what doesn’t. When I was watching the Whitney Biennial controversy play out—well, I didn’t just watch, I was in the scrum—two things struck me. First, there was an amazing amount of really significant and critical thinking happening, not in the spaces of the museum or academe or the conference or the lecture or the art magazine, but on Facebook and Twitter and Instagram. Second, all of this thinking would be lost to history unless it was recorded in some sort of systematic way. 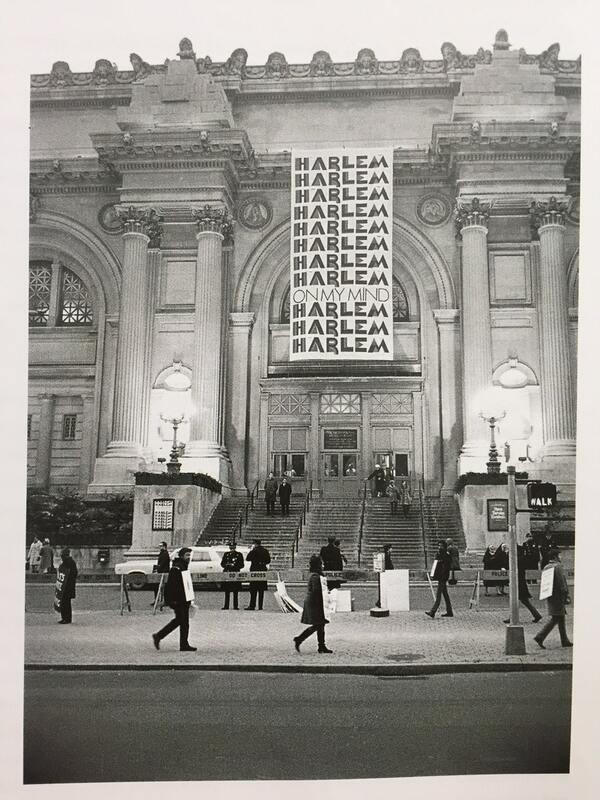 The previous two episodes I speak about in the book—the Harlem on My Mind exhibition at the Metropolitan Museum of Art in 1969 and the Artists Space show in 1979—had very different archival states. The former has been quite extensively written about, with other scholars having pored over the archives and done the digging. The Artists Space show hadn’t been written about in any extensive way, but there was a set of files at Fales Library at NYU (home of the Artists Space historical archives) that includes every piece of correspondence, every article that appeared in small independent newspapers and magazines, every bit of detritus surrounding that show. So all I had to do was find the story behind the artifacts. I don’t think I’ve created the archive of the Dana Schutz controversy; my book is too short and too partial for that. But I think I captured the shape of the debates, if nothing else. I would hope that the Whitney Museum sees fit to do something more extensive—to gather screenshots of social media posts, to find all the blog entries and articles from online magazines, no matter how off the beaten track, just as Artists Space did in a different technological moment—so that there can be a real reckoning. To me, that would be a really important demonstration of the museum’s commitment to grappling with the issues raised by the protest, and not just sweeping them under the rug, or worse, counting on the speed of our social media age to erase it from memory as we move on to the next uproar. One of the threads that connects the three acts in your book are the structures that protect whiteness. They are implicit in the founding of most large cultural institutions and are perpetuated to this day through the financial (and relational) mechanisms that support museums and galleries. In Acts 2 and 3 of your book you mention the threat of organizations losing state and city funds. What is your opinion about the role of the market more broadly and structural inequity in the art world? It seems to me that the reason the protesters in 1969 and 1979 had the kinds of leverage they did to effect real change is because there was public funding at stake—the Black Emergency Cultural Coalition managed to parlay the Met’s fear of losing funding for a museum expansion into the creation of satellite museums around the city (including the Queens and Bronx museums), among other extraordinarily important things. The Artists Space protesters were asked to go to Washington, DC to advise the NEA on how to ensure fairness in their fellowship programs; Artists Space agreed to hire an advisor on black outreach and diversify their curatorial program, also because of a fear of falling out of favor with the New York State Council on the Arts. When you have a museum that receives such a huge proportion of its funding from non-public sources, the stakes are different. Adam Weinberg, Glenn Lowry, all those museum directors are answering to their boards of trustees, first and foremost. I’d like to think they were answering to the public second, but in fact I suspect the public is much farther down their lists. It’s not because they are bad people; it’s because museums are structured that way. In order for the museum to exist, it has to serve the needs of the people who hold the purse strings, whether explicitly or tacitly. This makes it almost impossible to imagine effecting change, because no matter how liberal and progressive and even just plain good museum trustees are as people, how do you convince them to undermine their own privilege and power? And that’s what is at the heart of so many of the art protests happening lately, from the Whitney Biennial to the Brooklyn Museum (which was subject to decolonization protests this spring)—museums are being asked to reimagine themselves in radical ways, ways which threaten the power of the donor classes, among other members of the 1%. Thinking about how Whitewalling has the potential to open up the next conversation about art, race, and politics, I wanted to ask you what kinds of conversations has the book elicited? Have individuals reached out to you? And what has the nature of these “next” conversations been? The response to the book has been so gratifying—and in ways I didn’t imagine. People are using it, as I’d hoped, as a way to have all sorts of discussions both inside and outside the art world. I spoke to a person working at a blue chip gallery in New York who had read Whitewalling; she said that in addition to helping her think through certain issues in her work, it was proving helpful as she navigated conversations about diversity and inclusion at her child’s school, for example. Anti-gentrification activists seem to have found it useful for putting into words some of the things they see happening in Los Angeles. Artists seem to be thinking about it a lot, in terms of their experiences with all manner of institutions and how to change the narrative, and I think curators and other museum professionals are, too. But the conversations I’m most interested in, in the aftermath of the book, are the ones I’m not really part of. Whitewalling was never about providing a definitive account of art, race, and protest, but to lay a groundwork so that such work could happen in other spaces, from museums to classrooms to artists’ studios. You touched on some key ideas as to what the “next” conversation about art, race, and protest might be or needs to be. And rather than a conversation at all, you’ve described something more akin to a praxis that addresses structural power and involves a process of remaking (I liked that phrase you used very much). As an educator, the idea of remaking makes me think of the notion of unlearning, which is not so much about forgetting but the ability to choose an alternative paradigm. When we learn, we add new skills or knowledge to what we already know. When we unlearn, we step outside the mental model in order to choose a different one. From your perspective, where is the best place for institutional remaking to begin, or what might it look like in its infancy? One of my firmest beliefs is that many museum education and public programs departments are already doing some great work to push conversations about racism, white supremacy, and other struggles for social justice forward. This is partly because they tend to be more diverse in terms of staffing to begin with, and partly because they are often tasked with bringing diverse audiences through the door. So they are thinking about how to engage and how to design programs and experiences that are meaningful and relevant to those audiences. American museums tend not to involve education departments in the conception of shows—that’s usually left up to curators, with education being brought in later, once major curatorial decisions have already been made. But what would happen if curatorial decisions were made more collaboratively, with questions of audience put at the center? Interestingly, some science centers and museums around the country, in an effort to get black, Latinx, and new immigrant children and their families to visit, have done just that—they’ve found ways to tailor their exhibition programs to their audiences’ interests and needs, without at all diluting their rigor and scientific thinking. That’s not to say that they’re only doing crowd-pleasing programming, but they’re doing programming that has meaning and significance to an audience that has been underserved by such institutions in the past. I think art museums could learn a lot from these examples. In a larger sense, I think remaking begins with listening. Institutions talk a lot about listening to their audience, but then treat protests as public relations disasters to be managed—annoyances at best and crises at worst. But protests are moments in which part of the museum’s public—a vital, passionately interested part—is asking to be heard. I think institutions have to develop better mechanisms for listening, for absorbing what they hear, and for being open to admitting when they’ve made a mistake.